At present, we're in post-production on season three of Walks Around Britain, which comprises of 14 walks from around the country in seven 30-minute programmes. The editing is done by our Leeds-based editor Robert, so I begin Monday by batch-converting the next set of original HD camera files down to standard and Dropbox-ing them across for him to edit programmes five and six. He has already edited programmes one and two, and he sends me the edited files across which I add to the original footage folder, and the programme is instantly in HD. Next, I write the scripts for programmes one and two, record the narration in the voice-over studio here, and add it to the programmes, tweaking the edit where needed to make the voiceover work. With those two programmes done, the edit file goes back to Robert for grading. One of the local TV networks who broadcast Walks Around Britain is Made TV, with their channels in Bristol, Birmingham, Cardiff, Liverpool, Leeds and Tyne & Wear – and soon in Teesside. They contact me to say they have pencilled in season three for March – which adds a degree of extra impetus to the editing! Today, I’ve got to put my sales hat on, and I have a meeting with our sales and marketing manager, Catriona. She’s busy putting together the product placement deals to make season four happen, so she gives me an update on how that is going. From season three, we’re able to offer sponsorship of Walks Around Britain on Community Channel, so we talk through possible interested parties for that, and agree ways forward. It’s been a while since I’ve chatted to the director of photography on Walks Around Britain, Dave Thorp, so we have a long catch-up session on the phone. He’s almost at the end of being the DoP and editor on John Godber’s new film, and he tells me all about how the edit is going. I fill him in on the locations it looks like we will be going for season four, and we block-book some details for filming. 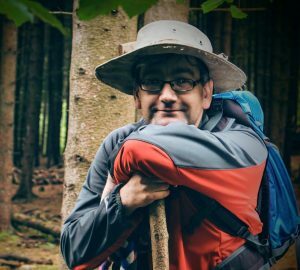 As well as working on the Walks Around Britain brand with Nova Productions, I’m also a freelance writer - and I’m currently commissioned by Barnsley-based publishers Pen & Sword to write four walking guide books. These are the first in what is hoped will be a long-running series of books, and getting the style, tone and template right for these is important. So today is day set aside for more work on the template side for the series – and this is what is taking a while to get right. A core element of the offering from Walks Around Britain has always been to create a range of DVDs, some featuring highlights from the series, but others with exclusive programmes. Central to this will be for a large outdoor retailer to become interested in stocking the range – which is tricky when you only have one DVD at present! Today though, I’ve had talks with a wholesaler who supplies one of the biggest outdoor retailers in the country... who also happens to be based in the North... which is nice. Positive signs on the road ahead on that. The rest of the day I take to writing some ideas for various magazines to pitch for freelance feature writing. Walks Around Britain is currently syndicated on 20 TV channels in the UK, and today I’m just about set to make it 21, with a long conversation with the channel PBS America. A contract needs to be signed, but we’re already talking about how to get the files for the series across to them, either FTP or MyAirBridge... so that’s very positive. A relationship with PBS America could be important in getting the series into 300-odd PBS stations in the US. I’ve had an idea about developing a season of Walks Around Britain devoted to walks around film locations, and this came another step closer to reality today with a conversation with a British classic film channel – who have agreed they will take the series and may be able to supply actual clips from the films for the season too.